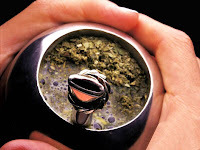 A highly stimulating infusion widely consumed in Argentina, Chile, Paraguay and Brazil, Yerba Mate is traditionally drank from a cuia (cured gourd) through a bombilla (filtered straw) made of metal or wood. Due to its lack of tannic content, the leaf is left in the gourd so as to allow multiple steepings and can also be brewed with cold water. The earthy, herbal flavor steadily mellows with each subsequent steeping, though the invigorating effects are only heightened with the passing of each round. Traditionally, a gourd full of Mate is passed around a group of people many times and the straw is never used to stir the leaf inside the gourd. Popular amongst hikers in the Andes, Yerba Mate is known to increase physical endurance, curb the appetite, sharpen the mind, and assist the gallbladder in processing toxins from the body. It contains Vitamins A, B1 (Thiamine), B2 (Riboflavin), C, E and 15 amino acids, along with a high level of antioxidants. Yerba Mate contains a significant amount of caffeine. We have 3 superb offerings from the world of Yerba Mate. Organic Brazilian Yerba Mate - Our House Yerba Mate is shade-grown in Brazil. It is full-bodied with notes of chocolate and earth and will surely put a spring in your step. Organic Argentinean Yerba Mate - The Argentinean Yerba Mate is all leaf (no stems here! ), which brews up a robust, herbaceous, yet smooth beverage. Roasted Argentinean Mate – This version of Mate is roasted to a rich chocolate hue, exhibiting aromatics of sweet tobacco and leather that lead into flavors of cacao, toffee and toasted grains. Widely popular in Brazil as a base to be mixed with fruit juice, this is an earthy, full-bodied beverage that can be enjoyed hot, iced, with or without milk and sweetener. A dark and mysterious diversion for the Mate lover!